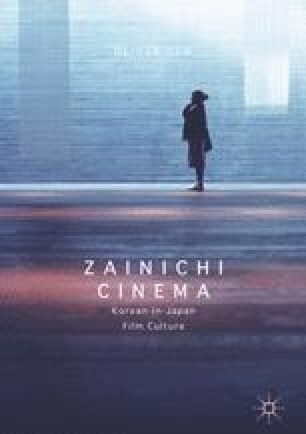 This chapter gives an overview of Korean-in-Japan film history, with a particular focus on the curatorial and critical impulse, evident from the late 1980s onwards, to name and map out a category of ‘Zainichi cinema’, drawing on broad swathes of film practice stretching back to the colonial era. I argue for the need to theorise the affective power of these films, but that this does not mean making a break with theories of representation (as in Thrift’s non-representational theory). Drawing on Laura Marks’s intercultural cinema and Hamid Naficy’s accented cinema, I argue that the ‘accent’ is by no means restricted to first and second-generation cinemas of exile and diaspora as Naficy contends, but is also tangible in the cinema of post-diaspora generations; and that the haptic and affective resources which Marks describes are not confined to formally experimental works but are also critical to the crossover film operating in mainstream modes of melodrama and comedy. Despite Zainichi cinema being a cinema predicated on representation, it is so frequently non-representational elements that are foregrounded in the popular print discourse on these films, in catalogue descriptions and newspaper articles.